Venice, Louisiana (CNN) -- The federal government is heightening the pressure on BP, pushing the oil company to do more to stop well leaks gushing thousands of barrels of oil into the Gulf of Mexico and to beef up its response to the potential environmental impact on the coast. "We'll continue to urge BP to leverage additional assets," U.S. Secretary of Homeland Security Janet Napolitano told reporters on Friday as the massive oil slick approached the Louisiana coast. "It is time for BP to supplement their current mobilization as the slick of oil moves toward shore." BP, which owns the ruptured well, said officials expect oil to reach land sometime Friday, with Venice and Port Fourchon the first places likely to be affected. Doug Suttles, chief operating officer of BP, said the company has had only three priorities since the April 20 rig explosion that led to the oil spill: stop the flow of oil, minimize its impact and keep the public informed. "We've so far mounted the largest response effort ever done in the world," Suttles said at the same news conference. "We've utilized every technology available, we've applied every resource request. ... We welcome every new idea and every offer of support." BP has been trying to stop the flow by using remote-controlled submarines to activate a valve atop the well. But the valve, known as a blowout preventer, is not working. A stopgap plan -- putting a chamber over the well area and sending the oil to a ship -- is unproven at that depth and could take four weeks before it's ready. The ultimate plan -- drilling a different well to access the first and close it with concrete -- could take three months. Meanwhile, efforts to contain the spill and stop the leak are costing the well's owners about $6 million per day, BP said. EPA Administrator Lisa Jackson said Friday there is a chance that workers will be able to stop the flow of oil into the Gulf of Mexico, but warned that the EPA is preparing for the worst. U.S. Sen. David Vitter, R-Louisiana, called on BP and government officials to split their duties between stopping oil flow and cleaning up the spill. "BP is spread too thin in trying to both cap the well and remediate the damage along the coastline, producing an inefficient and ineffective response," Vitter said in a statement Friday. "I urge all involved to allow BP to focus all of its efforts on building a dome and drilling a relief well at the source of the spill so that federal and state officials can focus their efforts on protecting and cleaning up the coast." As fears rose -- particularly in the commercial fishing industry, a critical economic engine for the region -- President Obama promised steps to prevent a similar disaster in the future. Speaking at the White House, the president said he had ordered Interior Secretary Ken Salazar "to conduct a thorough review of this incident and report back to me in 30 days on what, if any, additional precautions and technologies should be required to prevent accidents like this from happening again." "We're going to make sure that any leases going forward have those safeguards," he said. Salazar has ordered inspections of all deep-water operations in the Gulf of Mexico. The Department of Interior will also establish an Outer Continental Shelf Safety Board to conduct a review of offshore drilling practices and safety issues and tighten the oversight of equipment testing, Salazar said. Salazar added that the response to the spill would not affect oil production. "Oil and gas production from Gulf Coast that fuels the economy continues to flow today and will continue to flow into the foreseeable future." Federal officials, including the president, emphasized that BP is legally responsible for paying the costs of the response to and cleanup of the spill. Still, Obama said, "We are fully prepared to meet our responsibilities to any and all affected communities." Several top administration figures were dispatched to the region Friday, and thousands of federal personnel have joined efforts to help. Secretary of Defense Robert Gates has approved Louisiana Gov. Bobby Jindal's request to mobilize 6,000 National Guard troops in response to the spill, according to a Defense Department spokesman. The Guardsmen will be deployed under Title 32, which means the Defense Department will pay for their services for up to 90 days. Defense spokesman Geoff Morrell said Gates approved the mobilization because "the president has declared this oil spill to be of national significance, impacting multiple states." However, because the spill is BP's responsibility, "we do expect to be reimbursed," Morrell said. Gates is expecting such requests from other Gulf states and expects to approve those as well, he said. Earlier in the day, two Air Force Reserve C-130s specially modified with a spray system arrived in the region to spread oil-dispersant chemicals. Rough weather, including heavy winds and high tides, have hindered the effort, federal and BP officials said. Suttles said weather challenges would continue into the weekend, meaning water surface operations, such as oil skimming, would be suspended. Choppy waters can also drive the polluted water into the coastal marshlands and other ecosystems in southern Louisiana. "The potential danger is unfathomable, because we don't yet know how the leak can be stopped and how big the spill will get," said Ken Rosenberg, director of conservation science at Cornell University. "It's a full moon, a high tide, and it's bringing the oil on a free ride right into the coastal salt marshes on a southerly wind." Rosenberg said when the oil hits the shore, it would have an immediate impact on large numbers of birds, causing reproductive failure and possibly death. "If the oil then comes into the coastal marshes and the inshore ecosystems and kills the oyster beds and the shrimp and the fish nurseries," he said, "then there are much longer-lasting effects not only on birds but on an entire way of life for people of this region." Gov. Charlie Crist of Florida declared a state of emergency in several counties on Friday, saying the oil spill "threatens the state of Florida with a major disaster." Gov. Bobby Jindal of Louisiana declared a state of emergency in his state on Thursday. Some officials worried the destruction could surpass the Exxon Valdez disaster 20 years ago. That oil tanker ran aground on the Bligh Reef in Alaska's Prince William Sound in 1989 and spilled 11 million gallons of crude oil. Friday, as people along the Louisiana coast caught a whiff of the oil, those in Louisiana, Mississippi, Alabama and Florida feared an environmental nightmare of greater scope. "There's certainly immense potential consequences," LuAnn White, director of the Tulane Center for Applied Environmental Public Health, said Friday. "This is a disaster," said Dean Blanchard, who runs a wholesale seafood business in the region. "We definitely need some help." Biloxi, Mississippi, Mayor A.J. Holloway compared the potential economic impact of the spill to the downfall that followed Hurricane Katrina in 2005. "That was a tremendous blow to our city for several years and still has an impact," he told CNN Radio. "We just don't know what we can expect from this." Ten wildlife refuges in Mississippi and Louisiana are in the oil's expected path, with the Pass-a-Loutre Wildlife Management Area at the tip of the Mississippi River likely to be the first affected, Jindal said. Napolitano, Salazar and Jackson were among those who took an aerial tour over parts of the Louisiana area earlier in the day. They also met with government and BP officials to discuss cleanup efforts. 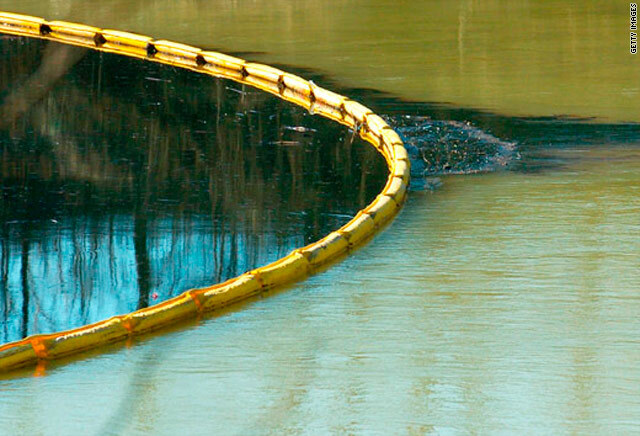 State and federal agencies have strung miles of floating booms -- inflatable or foam barriers -- around the leading edge of the shoreline to contain the spill. A handful of federal agencies have recovered more than 20,200 barrels (850,000 gallons) of oily water and had deployed more than 100,000 gallons of dispersant -- which breaks up oil -- as of Thursday evening, according to the Department of Homeland Security. Efforts to shut down the well have failed so far, and more complicated plans may take weeks, officials said. The oil rig, operated by Transocean Ltd., was ripped by an explosion that burned for two days until the rig sank. Eleven missing men are presumed dead. The Coast Guard on Wednesday raised its estimate of the amount of oil the damaged well was pouring into the Gulf to 5,000 barrels (210,000 gallons) a day -- five times more than initially believed. When the rig sank, a steel riser that connected the rig to the well collapsed to the ocean floor, and eventually remote-operated submarines would find three leaks coming from the riser or a related drill pipe. A test of burning off part of the oil slick destroyed about 100 barrels (4,200 gallons) Wednesday, said Suttles. The technique "clearly worked," and larger burns are planned when weather conditions make them possible. "We believe we can now scale that up and burn between 500 and 1,000 barrels at a time," Suttles said at the time. The well is now leaking from three points, BP said. Under the 1990 oil pollution act, passed in the wake of the Exxon Valdez spill, the company is required to foot the bill for the cleanup. BP said Thursday it has set up a "Vessel of Opportunity" program for vessel owners "to offer their services to assist with response efforts." Lawsuits seeking class action status have been filed on behalf of the workers and their families. The suits accuse Transocean and BP of negligence.